Earlier in the week, we shared The Iron Giant re-release trailer as Warner Bros. and Fathom Events announced the animated classic is heading back to theaters this September, prior to the release of The Iron Giant: Signature Edition Blu-ray. Now, we have word that a sequel may be in the works. And these words comes directly from The Iron Giant himself. Yes, Vin Diesel thinks we're getting an Iron Giant 2 announcement soon. He shared this on his Facebook page while promoting the return of this sci-fi adventure. "I have been very lucky to have played so many interesting characters... one of the first and one of my favorites is... the Iron Giant. P.s. Don't be surprised when you hear WB announce the sequel." Before embarking on the live-action blockbusters Mission: Impossible Ghost Protocol and Tomorrowland, Brad Bird made his mark with his directorial debut The Iron Giant, which hit theaters in 1999. 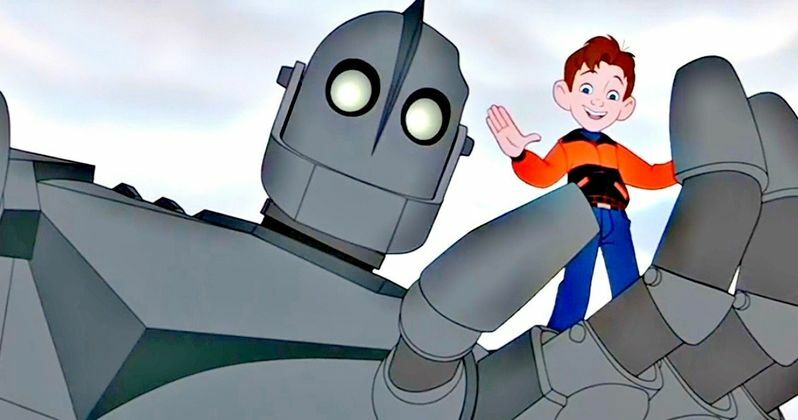 Winner of nine Annie Awards, The Iron Giant is the tale of an unlikely friendship between a rebellious boy named Hogarth (voiced by Eli Marienthal) and a giant robot, voiced by a then little-known actor named Vin Diesel. The voice cast also included Jennifer Aniston, Harry Connick Jr. and Cloris Leachman. The film was produced by Allison Abbate and Des McAnuff from a screenplay written by Tim McCanlies. Adapted from poet Ted Hughes' book, The Iron Man, The Iron Giant was first released in the summer to lackluster box office numbers. But emerging in the era of the DVD, it took off as a home video release, and has been a cult favorite ever since, gaining loyal fans every year. The Iron Giant made history for being the first CG character incorporated into a traditional animated movie. Vin Diesel, who only had one line of dialogue as the title charter at the very end of the movie, was not yet the marquee star we know today. In fact, he was two years away from starring in the very first The Fast and the Furious, which would make him an international superstar. Since this is the first we're hearing about The Iron Giant 2, no plot is known. And it isn't known if Vin Diesel will get more lines this time around. The Iron Giant: Signature Edition arrives in theaters for a special event screening on Wednesday, September 30 at 7:00PM local time, with an encore event in select markets on Sunday, October 4 at 12:00PM local time. The event will be presented in select movie theaters around the country through Fathom's Digital Broadcast Network. Following the re-release of the film in theaters, a high-definition version of The Iron Giant: Signature Edition will be available to purchase from digital retailers in the fall of 2015. The Iron Giant was hailed as an instant classic by many critics upon its release in 1999, but it only took in $23.1 million from a $70 million production budget. In the years that followed, the animated classic built a devoted cult following, with many of these fans now getting to see the film on the big screen for the first time. The Iron Giant ended with an open-ended finale that left potential for a sequel. And with it being animated, there doesn't need to be a significant jump in the story's timeline. Who knows when or if The Iron Giant 2 will truly be announced soon. Brad Bird is already working on The Incredibles 2 for Pixar, and it's kind of hard to imagine Warner Bros. handing the reigns off to another director. But then again, the studio is notorious for making direct-to-video sequels to some of its biggest hits. Let's hope that doesn't happen here. It was believed that The Incredibles 2 wouldn't be in theaters before 2019. But there are some rumors claiming that it will hit theaters before Frozen 2 in 2018. However it shakes out, if Brad Bird is directing The Iron Giant 2, chances are we wouldn't see it until at least 2020. What do you think?